We’ve seen that the radio looks like it’s in decent physical condition. A can of compressed air like you’d use to clean a computer keyboard was useful in cleaning 74 years of accumulated dust from between the plates and coils; wet wipes and a damp sponge helped to clean up some of the surface grime. Now it’s time to start initial tests. We’ll begin with the tubes. 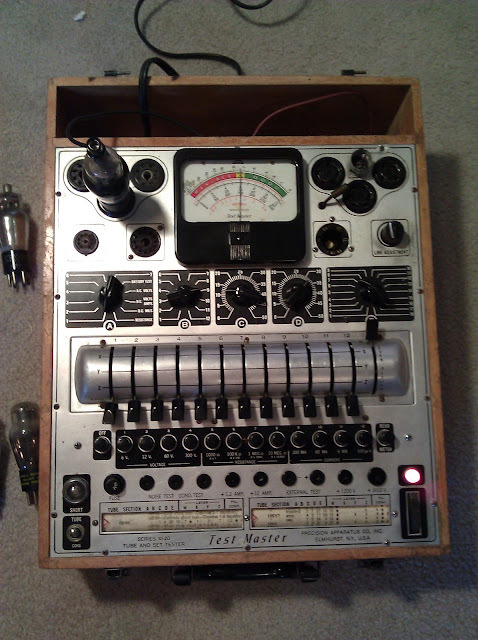 From left to right, the radio came to me with the 6A7 (modulator/oscillator), 6D6 (IF amplifier) and 75 (first audio) tubes (shown in the top row.) 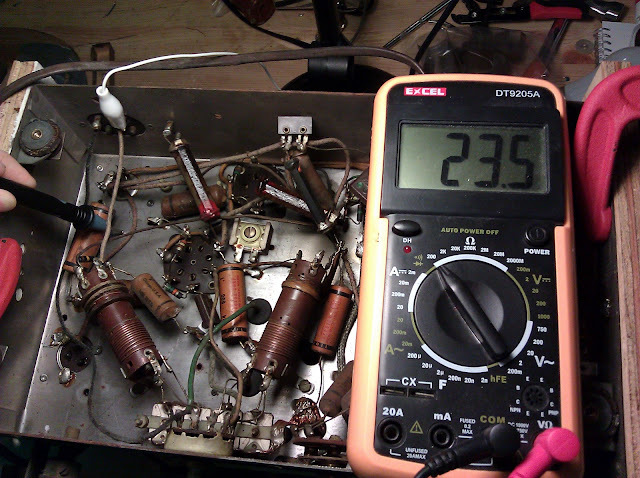 From my own parts stock, I’ve found a type 42 output tube and a type 80 rectifier tube pictured on the bottom row. 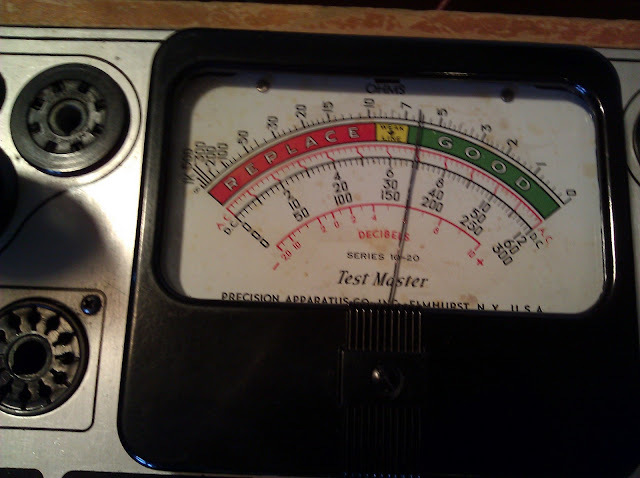 The Precision 10-40 is a “Dynamic Conductance” tube tester, which partially approximates actual operating conditions in the radio. It’s not a perfect test, but is useful for quickly sorting good from bad tubes. The controls on this unit allow you to set the operating parameters for the tubes (filament/heater, plate, grid and bias voltages) and set their connections. It checks for bad tube elements, as well as overall emission. Shown here testing the 6A7, which was good. I repeated this process for all 5 tubes, and found that 4 test solidly good and only 1 tests marginal. 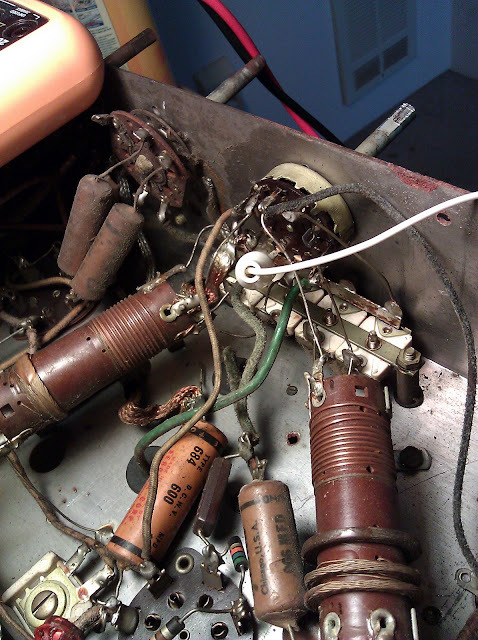 The only marginal tube is the 75 First Audio, which just barely falls on the “replace” side of the weak line. Even significantly weak tubes can continue to perform okay, but at a certain point the audio starts to lose volume. This one will be fine for testing purposes, and probably fine for another decade of listening, but will end up being replaced at the end. This radio is in great shape for its age and there are no immediately obvious defects. I’ve seen radios with mashed in tuning capacitors, tubes snapped off in the sockets, dangling wires and such and this radio has none of those. If the passive components in the radio (components, coils and transformers) are in good condition or are repaired, the radio will work. Now it’s time to check the durable passive components: the antenna coil, oscillator coil, both IF transformers, power transformer, speaker output transformer, field coil and voice coil. 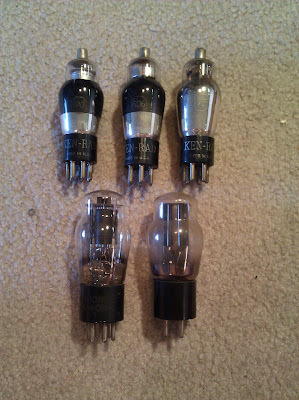 This set was sent to me identified as a Grunow model 586. When I started to trace out the circuit, however, I noticed differences in the coil and bandswitch arrangements. 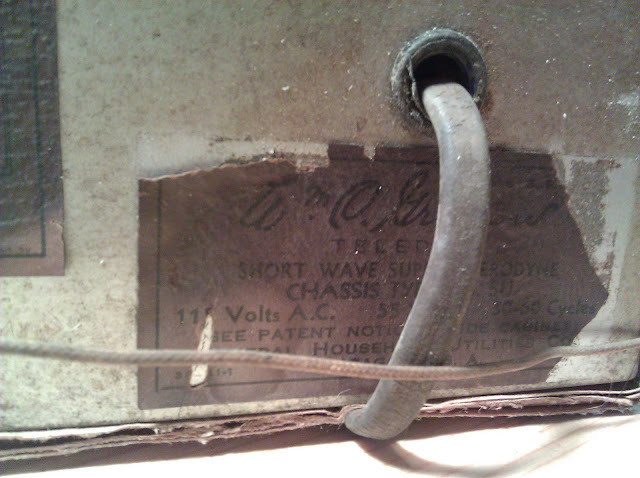 This led me back to the original chassis tag which identified the chassis as type 5-U, not the type 5-W chassis installed in the model 586. The Grunow model 589 (or possibly the 587 or 599) is the correct identification for this model radio, depending on the cabinet and speaker options installed. Shown in this snip of the schematic is the input stage of the radio from the antenna and antenna coil on the left, oscillator coil in the center and the 6A7 modulator/oscillator tube. A tube serving as both modulator and oscillator is also frequently called the “converter”, and for brevity’s sake I will be using that term going forward. It’s called the converter because it converts the incoming radio waves to the intermediate frequency in one step using one tube where earlier designs needed to use two tubes. 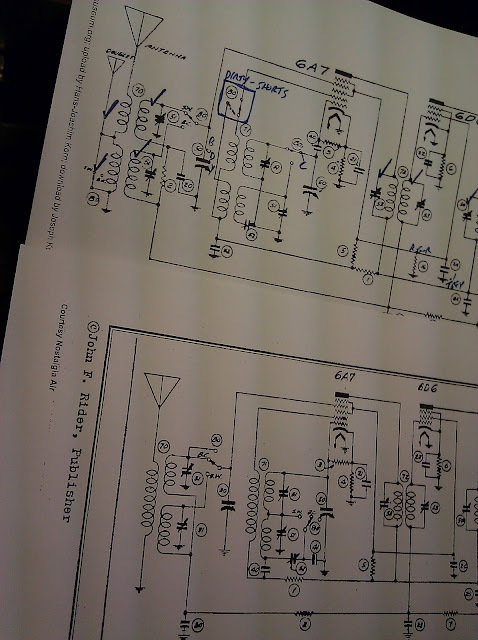 The top schematic is the correct one; the bottom schematic is the incorrect schematic, just for comparison. On the left is the antenna coil. The primary goes from the Antenna input down the winding to the chassis ground as does the Doublet (dipole antenna) input. Each of the two secondaries is switched depending on which band is selected using the band switch knob. The oscillator coil is similar, towards the center. In the 586, the oscillator coil secondary is center-tapped and the switch bypasses part of the coil; in the 589, the broadcast and shortwave oscillator coils are wound separately. That’s about the only difference between the two chassis. It’s a slightly more complex coil arrangement, and might yield slightly better performance, but it’s really a very minor difference. The limiting factor in this set’s performance will be the fact that it has only five tubes. 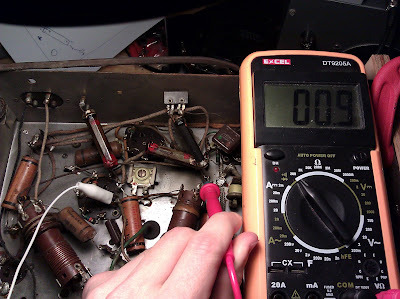 Checking the antenna coil’s integrity is easy, just use the multimeter. 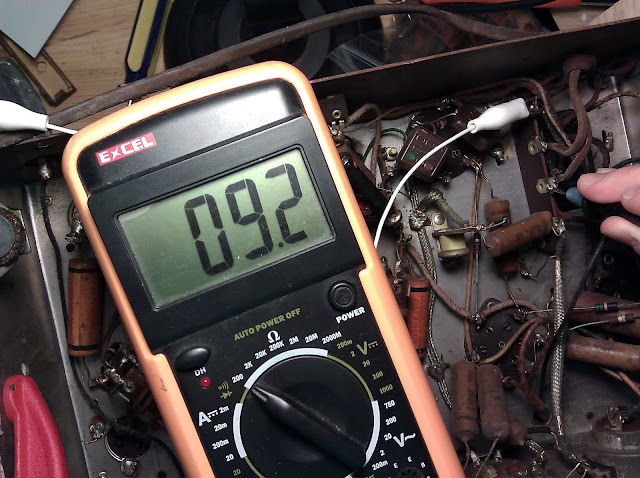 Shown here the antenna coil primary measuring 23.5 Ohms. Looks good. I tested the secondaries through their entire signal path (from the grid cap on top of the 6A7 through the band switch in both positions) and found them to all be good, so moved on to the oscillator coil. The primary windings of the oscillator coil are switched from Pin 4 of the 6A7 converter through the band switch to the junction of a pair of resistors that feed the 6D6 IF amplifier. Next up is to check the IF transformers. 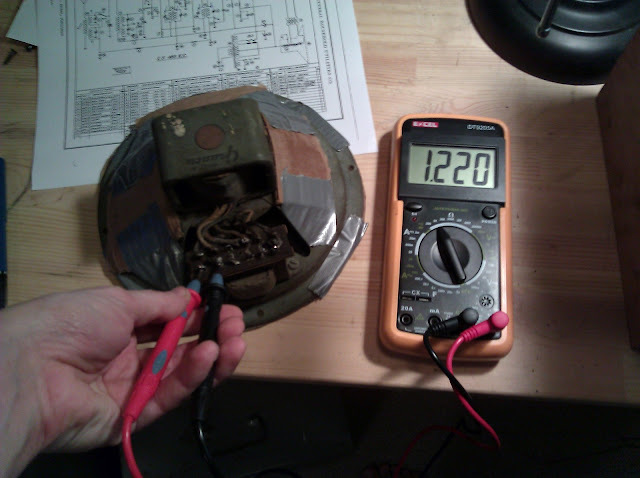 There are two transformers, each with two windings, so a total of four tests. Selecting the tie points for the leads from the schematic, I test continuity the same as the antenna and oscillator coils and find that all IF transformers are intact. And so is the power transformer! All those coils check out as well. In addition to these pictured checks, I tested the tuning capacitor for shorts by attaching one lead to the stator, and one to each rotor segment, and moving the plates through their full range of motion. The plates showed no connection throughout their full range of travel, so there should be no dead spots on the tuning dial and it should track properly. And finishing off with an alignment when complete. Coming up next: replacing passive components. So far aside from a light cleaning, nothing has actually been done to the radio besides a lot of poking and prodding – that changes soon. 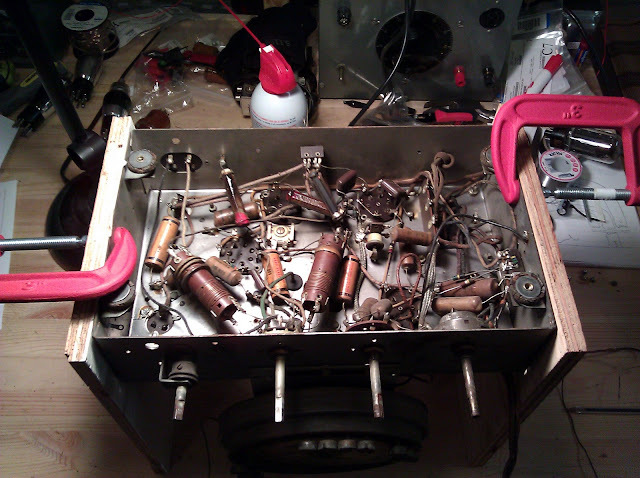 This entry was posted in Projects, Radios and Tubes, Vintage and tagged antique radio, fixing an old radio, grunow, grunow 586, grunow 589, grunow chassis 5-U, grunow chassis 5-W, grunow radio restoration, grunow schematic, repair, restoration, teledial, tube radio. Bookmark the permalink.